If you take a long strip of paper, tie a simple overhand knot in it, tighten it up, and press it flat, the result is a regular pentagon. 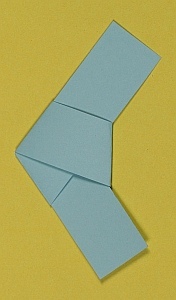 That construction is well known, and can be found, for example, in Martin Gardner’s Second Book of Mathematical Puzzles and Diversions, where it is also pointed out that if you add one more fold and hold the paper up to the light, a pentagram shows through. Try it! A newer idea I haven’t seen before is to continue knotting the strip into complex spherical patterns. 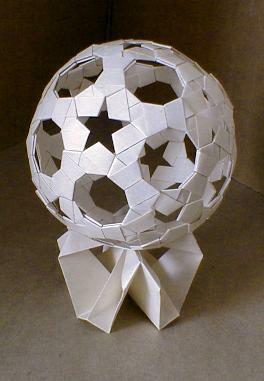 Heinz Strobl designed this paper sphere made of 120 knots. It has twelve star-shaped openings and twenty openings that are nine-sided. This model is made by Rosa Sanchez. Instructions to make your own are given by Paula Versnick here. 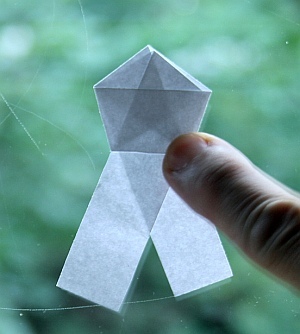 This article first appeared on Make: Online, October 11, 2010.